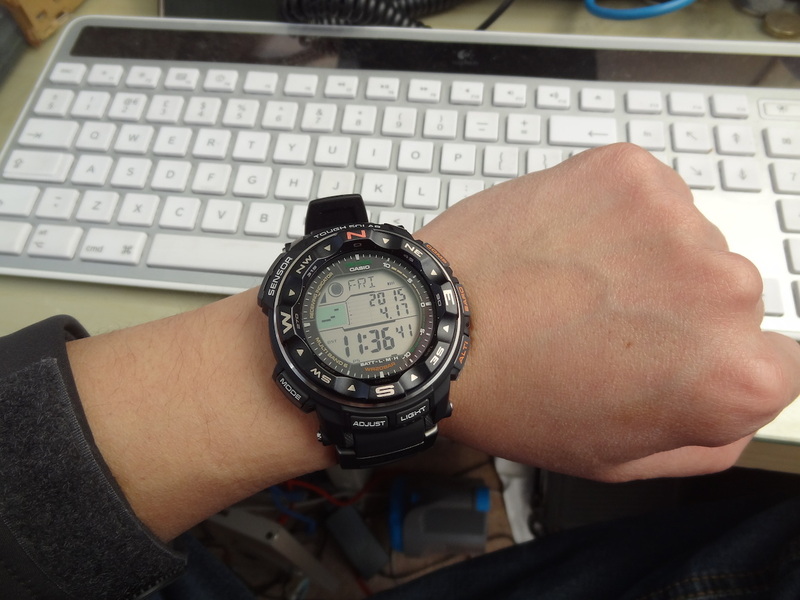 This is a sporty mens Casio Pro Trek model. Features for this watch are a direction bezel which can be used to determine approximate directions, altitude addition, altimeter data memory, thermometer, moon age display, altimeter, auto illuminator, 5 daily alarms, barometer, countdown timer, digital compass, multi band 6 radio controlled, solar power, stop watch, tide graph display, 200 meter water resistant, world time, auto-calendar, low temperature resistant, mineral glass and a yacht timer. Great service with amazingly speedy delivery the item I purchased was excellent and I would thoroughly recommend the Watchshop to anyone contemplating them for their purchase...... couldnt fault them, thank you Watchshop. I am a shore walker and Ive spent some time searching for a timepiece that would give me the tools that I need. This watch is exactly what I wanted. It has a good compass and tide/moon graph, set the local high tide and you can plan your walk safely. The barometer/temperature allows you to keep a check on changing weather patterns, the altimeter can be useful but you must remember to calibrate on a regular basis. If you fancy a swim or a dive its water resistant to 20m. The resin strap is easy clean, with all the normal features youd expect the solar powered battery and radio controlled time make this an outstanding watch. Id highly recommend it for those who swim, dive, fish, sail or just love walking coastal paths. This is a great looking Watch, has a lovely clear display, with good bold figures. It looks a masculine chunky Watch, but is vey light to wear on the wrist. Love the different functions of the Watch, especially the barometer and pressure readings. I have been checking these against my weather station, and have been bang on every time. The Watch looks good on the wrist whether you wearing it for around the house, out on an adventure or night out with your friends. Great watch, and excellent service from Watch shop. Would highly recommend to friends and family. I’ve had the watch about 3 week so still finding out what it will do, but so far I am impressed with its functions and accuracy. Compass, altimeter and barometer seem quite accurate. No issues with the solar charge even at this time of the year. To some it may not be the best looking of watches but it is functional and sturdy and I am very pleased with it. Fantastic . looks great. And works great. Simple to use aswell . Very good as Christmas gift. I bought this watch as I had previously had protrek that I loved but had lost. This watch is brilliant. It is easy to use, not too big and has great functionality. Has a good number of additional functions that can be used but not to a point where it is ridiculous the main one obviously is to tell the time!. I really like this watch and would highly recommend. My new watch does all it says it will and I am very happy with the functions - I always go for the wave captor model as you know the time will be accurate. Also stylish and functional. 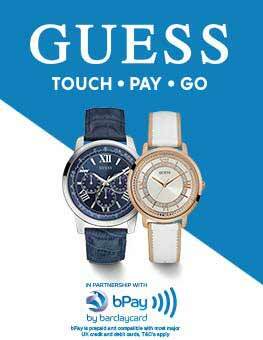 Watch shop delivered on time and at a competitive price. So that you can understand my opinion of this watch better I will explain my background. I am a retired instrument/electronics engineer with a fascination for gadgets. I am also somewhat of a perfectionist when it comes to said gadgets. I do a lot of walking and hiking nothing strenuous or too adventurous which is why I wanted a watch with a compass included. This watch is the 1st watch I have purchased in over 45 years, my last one was a Casio calculator watch back when calculators were still a novelty. The watch is the usual Casio quality and although quite large it is very light in weight and easy to wear. The strap although comfortable was a bit on the stiff side for my liking making attaching it to your wrist a bit tricky so I replaced it with a generic 22mm NATO style strap very easy to do which has made the watch even better also eliminating the sweat build up common to rubber straps. The face of the watch is quite easy to read and moving between the various modes not difficult. The backlight is not a lot of use, it only seems to change the background colour and not illuminate the display at all. As I don’t live near any tidal stretches of water the tide function will not get used so no comment. Power saving and atomic clock functions are interesting to observe and work as described. Charging the battery is a breeze, I set up a LED light to leave next to the watch and it charged within the times advertised. Only time will tell on the batteries capacity. The Moon phase is good as are the time, stopwatch functions, why Casio display the year is baffling as it is not the sort of information your likely to forget. It would have been nice if Casio could have arranged for the date format to be changeable from Month-Day to Day-Month. The barometer function is very good and has remained accurate to the Met Office published figures and my home weather station since setting it 2 weeks ago never varying more than a few hPa. 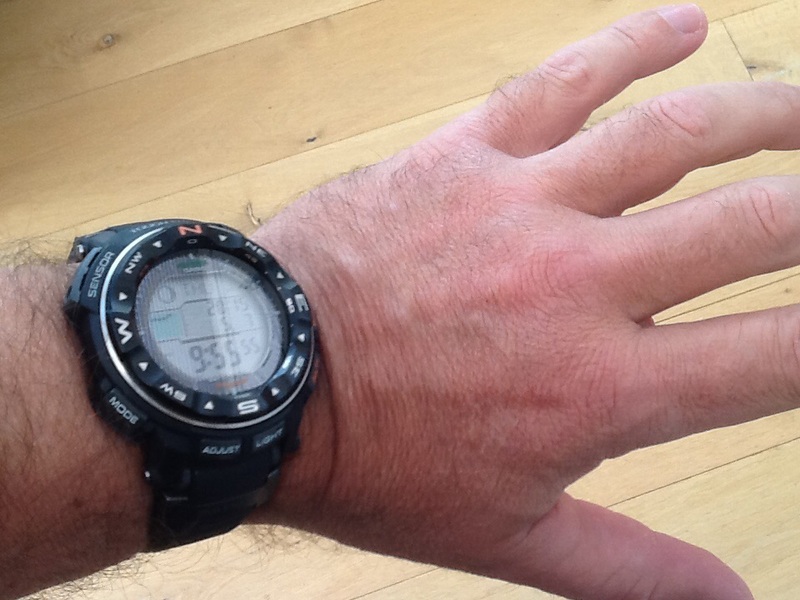 The altimeter is of no use at all as it depends on barometric pressure to arrive at a figure. On one recent walk I set it to the altitude shown on my map and wandered down a steep hill and checked it at the bottom it was within 5m together with my satnav figures so not bad so far. However 4 hrs later the figure was out by about 40m while the satnav remained accurate. As it is not accurate even with constant calibration the same on all barometric altimeters I would rate it as not worth bothering with. The compass I found to be impressive and provided you hold the watch level a small built in spirit level would have been useful it has never been off by more than a few degrees. The one occasion it went to its maximum deviation of 11 degrees was when I was standing under some high tension power lines! Overall a good watch, bearing in mind not having anything similar, I have nothing to compare it with. The watch is exactly what I expected - vision , functionality and materials are top of its class and beyond ! Do not hesitate - Go for it ! Watch Shop service is perfect as well. Super fast shipment with tracking details even when normal shipment option selected ! Thank you. The watch does everything as advertised. 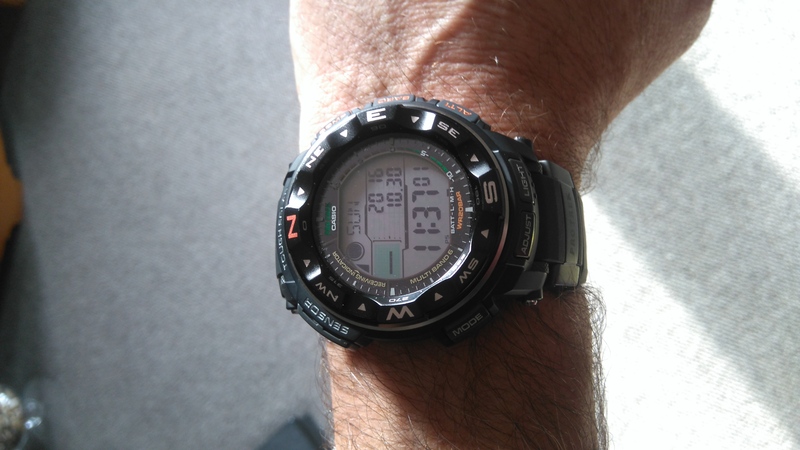 This is my second Casio solar + radio controlled watch, and the first has operated flawlessly for 9 years and is still going. Its very welcome never to have to touch it for either battery change or timekeeping. The temperature measurement is not very useful as when the watch is on ones warm arm the reading depends more on body heat than air temperature, but thats inevitable with a watch. The altimeters accuracy is dependent on local barometric pressure i.e. weather, so typically is out by several hundred feet, but again thats not Casios fault, and this is clearly documented in the manual. Altitude can be user-calibrated if one can be bothered to follow the daily variations. The watch is quite big and heavy, and the strap can trap arm hairs. Overall however a very nice piece of kit. Casio produce decent watches these days - and this is one of them. Slightly difficult to read in certain lighting conditions, but overall a good clear display. The strap feels very sturdy and should last as long as you look after it, e.g. clean it after use in water, etc. I use it for kayaking. Accuracy of the timekeeping in undeniable. Not worried about the direction/bearing finding as I only need rough estimates. Not too big on my wrist and setup is very simple, with not too many buttons to play with. Overall, a cracking piece of kit, especially at the discounted price of £192.50. Bought this to replace my old Gulfman which has done sterling service interface and controls similar, and tide function is much improved. I am just getting into the barometric function, which looks as though it could prove useful in forecasting the weather, and the battery charging appears v. effective. All in all very satisfied with my purchase. Bought this for my husbands birthday present as hes a sailor, surfer and walker and it does everything he could ever wish for! Hes yet to test out all the functions but hes really pleased with it. Its a good size and not too big and he likes that the time is digital. Great delivery and on time. Fast delivery at a great price. The third watch I have purchased from Watch Shop. Two weeks gifts, the third us for me. This is a really comfortable, feature rich watch that feels robust but light and not particularly chunky. Im very happy with the purchase and hope and think the watch will last which will make the cost well worthwhile. I found the whole shopping experience a pleasure. Im very happy with the Casio watch and price, thank you Watchshop! Definitely a versatile, and rugged waterproof watch that matches my outdoor lifestyle! Perfect for orienteering, featuring compass, altimeter, barometer, and tide graph. Additionally, radio controlled time, solar power, time zones, multiple alarms, timer, and stopwatch make this watch unbeatable in terms of functionality, and usability. Chose this model specifically since the black compass dial reduces flash, and visibility for military training. However, I would argue that my previous Pro-Trek watch has a chunkier interface for ease of use with gloves for the side buttons, though no real major issue, and that the data storage is limited to altimeter/compass readings rather than any alphanumerical data storage that some other Casio models possess, however this is a welcome extra feature over my previous Pro-Trek watch. Overall, an excellent watch fit for purpose, and boasts excellent function, and durability. This watch was chosen after years of having casio g-shock watches. I chose this one particularly for the thermometer and barometer. The fit is very good as I was concerns it would be to big as I havent got the biggest wrists. The functions of the watch are nicely thought out and not too complicated. I went for the rubber version over the titanium as apparently the metal scratches quite easily. The presentation box it comes in is very pleasing and the watch looks and is top bananas. My wife actually bought the watch for my 40th birthday in a couple of months, so I have not been allowed to fully explore and test this watch. The 30 minutes I was allowed to play with this watch was not disappointing and left my wishing I was 40 today. Role on June! I bought this watch for myself and Im very happy with the purchase. Watchshop were excellent and I have no complaints. The watch is brilliant and the features are exactly what I wanted, a must for any outdoor activity. I found setting the watch up to my time zone a breeze and the accompanying manual easy to navigate. My son is ba bit jealous and wants one too. Throughly recommend. Very good service, prompt and perfect. Totally hassle-free. Very much satisfied with the variety of watches on offer, ease of going through the process, and the prompt next day delivery. 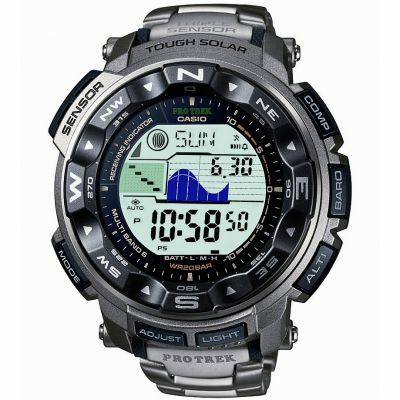 Ordered Casio Protrek, and happy with my decision - both with the watch as well as with Watchshop. 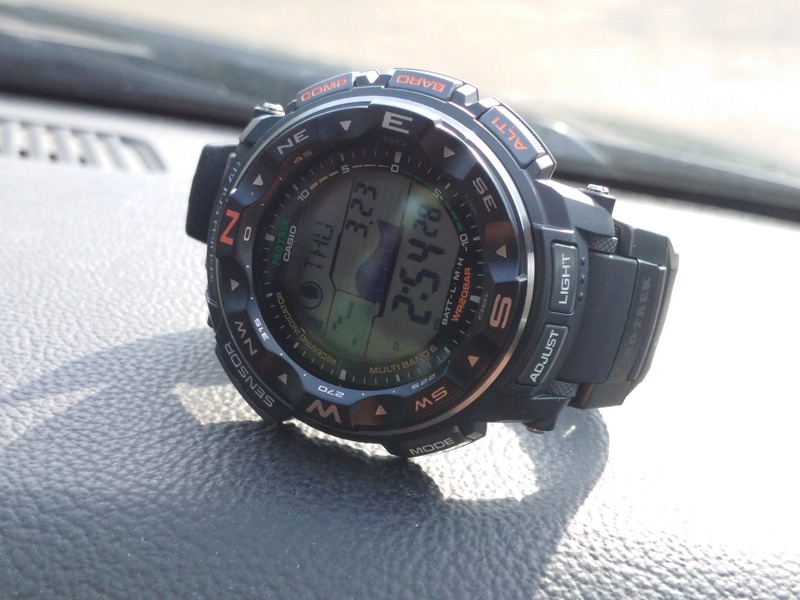 If youre looking for an outdoor watch you wont go wrong with this casio prw 2500. Feels robust enough to take on anything! Looks great on and isnt cumbersome, Ive been wearing mine daily and is very comfortable, abc functions seem very accurate, moon and tide graph is a nice bonus, solar power with battery level and atomic feature means no more setting time or changing battery! All in all an excellent watch.. purchase this watch if youre thinking about it, you wont be disappointed. Service rating : Service was just excellent, ordered late on Friday, watch was on my wrist on Monday. Well packaged with all documents etc...would definitely buy again. Watch is great too ! Product : Great watch, replaced a older pro trek model. Has all the functions of the old one, plus tides and moon phase. Barometer graph could be bigger. Tide function works well, if a little confusing to set-up. Could be improved by displaying actual hi / low tide times instead of just the graph and the hr step through. Is comfy to wear, backlight clear, could stay on a tad longer, not sure if this is adjustable yet. Manual is massive. I have received this fantastic watch. It is wonderful and cheaper than in any other place. I want to thank you Watchshop for a great service and price. Great service! Cheapest price I could find for the watch I wanted and amazing delivery service. Thanks! Excellent watch which has meet all expectations. Main features for me are the tide and Barometer which can be adjusted for local differences which is what I needed. Would highly recommend this watch for anyone who is looking for a simple watch that does pretty much everything!! I actually thought it was going to be bigger than it is but thats a good thing as I didnt want it to be that big! Its very easy to read ans follow instructions. The only downside as previously mentioned in other reviews is the fact that the date is in MMDD format instead of DDMM - takes a while to get used to it! Also, the temperature not being accurate is very annoying!!! Fits good, looks Hi-tech. It is Hi-Tech ! An amazing watch! Has got everything you need. I am extremely happy. This is my first digital watch and seeing as I grew up in the eighties that is saying something. Over the years I have spent a great deal of money and endured a great deal of frustration discovering that many watches that are designed to be tough and functional just dont live up to the claims of the manufacturers. 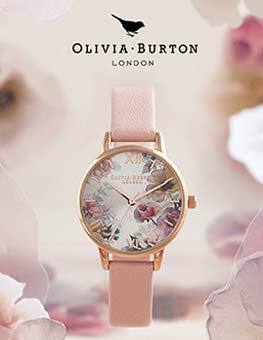 This watch is another story altogether! I have found that trouble starts when you have to whip the back off to change to battery. So I am really pleased that it is SOLAR POWERED and will never need a new battery and thus will never need to have its pressure resistance compromised by the incompetence of someone else who cant be bothered to reseal the precision instrument properly… WATERPROOF TO 200M. Did I mention that? its implied! RADIO CONTROLLED! I love this! I cant wait for the moment when I have to call up the BBC to tell them their clocks wrong! I just wish I had figured out how to put it on its auto setting before I went abroad the day after it arrived. TOUGH AS ANYTHING! Its already been kicked across a Spanish tiled floor! WAVE GRAPH is pretty and quite useful as Im close to the beach. ALTIMETER AND BAROMETER Im sure work perfectly well, but Im not going to try to remember how they work even though they spring to life at the touch of a button. What is awesome is a one touch DIGITAL COMPASS! and it works… properly! Nice little design details too, like the brail indicator underneath the light button… great! Ive had a lot of watches, this is by far my favourite. This is a very good watch for the money and is only the second solar watch Ive ever owned. OK, so it takes the temperature of your wrist instead of the environment Im not sure many people would take it off for 20-30 mins just to see the real temperature, but its still got a plethora of functions to play with. I turned off both the global function beep always annoys me with Casio watches and also the progress beeper in the countdown alarm beeped 36 times in an 18 minute countdown for my oven chips when turned on!. I love that you can replace the strap either with the same resin strap or any other standard one, which is flaw in the cheap Casios my 30 quid Wave Ceptor has unreplaceable straps - I broke 2 resin ones and a metal one too and basically had to replace the watch each time. Although this watch has a 2 year warranty, I was a little surprised that the strap, the case, the glass face and even the rechargeable battery arent covered by the warranty, though I guess if any of those items were shipped damaged in the first place, Im sure theyd have to be replaced for free. Casio missed a trick with the daily alarms - for some reason, theres 5 daily alarms instead of 7 and, even more bizarrely, you cannot set the day of the week that each of the alarms go off! So if you set all 5 alarms, theyll all go off every day of the week until you cancel them, which I cant see anyone ever want to happen. I had a fiddle with the compass, altimeter and perhaps the most useful special function - the barometer. I really like the 10 hour graph that shows the barometer trend. I would say the only somewhat surprising downer is that - unlike my 30 quid Wave Ceptor - you cannot change the date format from US MMDD to UK DDMM format. Considering everything else is highly configurable, this is an odd omission and one that does grate because the wrong US format date is staring at me all the time when I look at the watch face! Overall, if you can get this at a decent price like The Watch Shop sell it at, then I highly recommend it. The RRP of 275 quid is far too much for a digital watch no matter how much functionality it has, but luckily most places sell it for a lot less. A very nice watch with several features. Id suggest reading the book and setting it up so its operating accurately. I thought it would be very large. Its larger than some watches but not crazy in size. I have small wrists and and quite comfortable wearing it. A great buy, very happy indeed. Id recommend this watch to any outdoor person and also anyone who just likes gadgets. It has a pretty cool feature where the light will come on at the rotation of the wrist. This is great for checking the watch at night. This watch is by far my number 1 watch to date. I love it, its solar powered. It has a digital compass. World clock. Stop watch. Temperature reading. 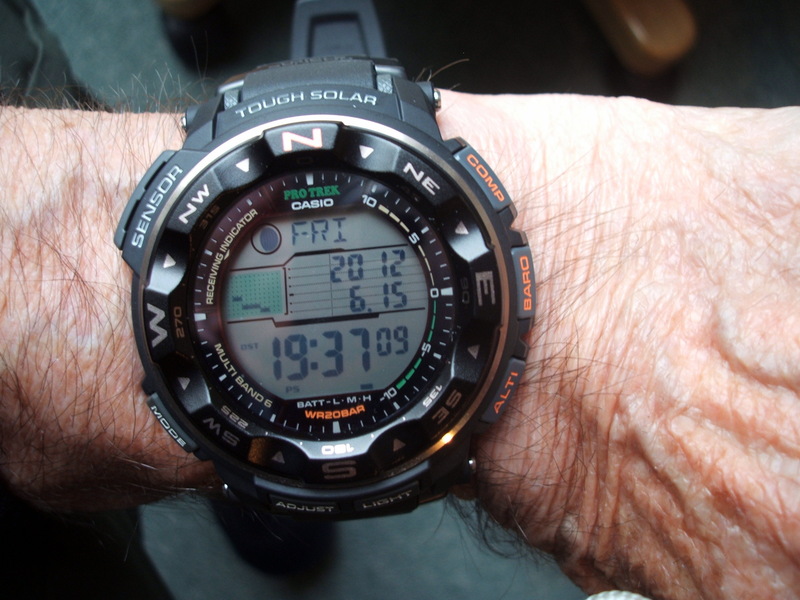 Altitude reading, Auto Light when you tilt your wrist. It also has more than 5 alarms. It has Moon phase. Tide wave, and the list goes on. The compass came into hand yesterday when I had to pray outside, it helped me find the direction to pray towards during my brake at work, it literally is a amazing watch. It is 200m WR from what I remember. It is solar powered which is my fave feature of the watch. No need for battery change. The watch has been on High Power since i bought it and ive been using almost all the features daily. The only down side is, when the light is turned on via the button or via tilting your wrist, it only lights up the watch for a mere second or two, rather they should make it so it is turned on for 5 seconds allowing you to view the time date etc without having to keep pressing it to view all the data on the watch. The strap is perfect, very flexible as it wont break, which is usually my biggest fears with watches. All in all, its a great watch and i would highly recommend it. even as a everyday normal use its perfect. I wear this watch more than my armani exchange watch. I seriously love this watch. It looks good, its chunky and hard wearing. Its also got lots of great gadgets and functions on it. On first glance it looks like it might be quite complicated, but actually its very simple to use. Very pleased! Upgrades to this watch from the PRG-240. And I have to say this watch is nicer. One of the first things I noticed about the watch was how much shaper the display looked. The home screen holds a lot more information than my previous pro trek time, tide and moon chart, barometer, date. Compass is accurate and I have tested this against with a regular compass. I havent tested the altimeter yet though. The only thing I wished it had was a sunrise and sunset time but its not essential. Overall this is a great watch with plenty of gadgets that would be ideal for any outdoor enthusiast. First of all really pleased with the quick delivery to my selected shop. I was kept informed all the time about the order progress. I did all the research about the functions that I wanted. I use this watch mainly for walking and trekking, I like the sturdy build and long strap so you can fit it over your outer clothing. Everything well thought out. I had to read the manual a couple of times, but it was easy to do the setup and all the adjustments. Very pleased. At this price is a real bargain. I enjoy all the features of this watch, especially the barometer, tide graph and moon indicator. It is always accurate due to the atomic radio signal time keeping. The only drawback I found was that the bezel scratches quite easily resulting in the aluminium underneath showing through. It would have been better being made out of plastic like my previous PRG 40. Superb watch. Tough and with all the features I need for a busy outdoor lifestyle. Very pleased with the Protrek 2500 watch and the service I have received from the Watchshop. I will definitely make the Watchshop my first port of call if I need another watch. This is perfect watch if you are outdoor enthusiast altimeter barometer thermometer moon phase tide graph solar powered radio controled what else you would need for a watch. Comfy to wear it does not feel bulky I have g shock and edifice and this is most comfy so far. Sensors are ok altimeter is conected to barometer so reading can vary depending on weather change but you can fix it manualy other sensors are accurate. For the money you cannot get better watch. It is excellent product for its price and delivery is quick and the service is good with step by step information. Basically this watch has everything, reliable brand and tough. Should last for years. 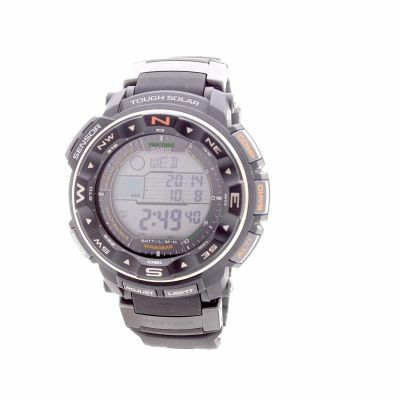 A useful watch, I bought it for its barometer and compass and they are good for what I want. The barometer / altimeter seems to be pretty accurate for the mountains of Snowdonia. I checked it against a nearby coastal weather station and it was spot on. The compass - I am not quite so confident about. Only feature that I felt was missing was a lap split and memory on the stopwatch. Not the newest pro trek but still delivers everything it claims to. As an owner of other Casio watches the solar power aspect prevents problems that can arise from replacement of batteries I have had in the past. Once set up correctly it wont miss a beat. I am really happy with it. Great watch. Will be usefull as a boat owner who looks at tides and weather changes for fishing. Great watch, it is providing me with all the features that I need. I use it every day and also for sailing and walking. The Pro Trek looks and is robust. I was worried it might be too bulky on my wrist and yes it is bigger than my GShock but very comfortable thanks to a good strap. The retainer on the end of the wrist strap to prevent it slipping out is good. I will probably try to get a spare strap for when this one dies, as these plastic ones tend to do over time in a tough environment. The pins for the strap are really robust. It does take a few minutes to set up the tides to location, calibrate the thermometer and learn the functions but it is worth it. Once set up its all pretty intuitive. Barometer is addictive, watching trends with rapid rises and falls highlighted. I will use the compass to take bearings, being able to use the besil to with up a target then just press Adjust to record the bearing is really useful. Ok, I am not going to steer my yacht by this compass but is is good to get fixes. I bought the all black watch, not keen on the Orange lettering for North, alt, baro & comp. I would have preferred white myself. On reading the handbook the advise to keep the watch face exposed to sun as much as possible including not covering the face with your shirt sleeve seemed odd. I now leave the watch on the window sill when I am not wearing it. When I am at sea this will not be an issue. Ideally it would have a GPS too, but couldnt find one that had these features. Not to mention price and battery life. This watch is great. The features are extensive and is robust enough for my busy life above and below the water and uphill and down dale. Some people may think it is a little too big, but it is certainly not excessive. You get used to it after a few days. The compass and barometer are great and pretty accurate. If you are looking for a watch that matches your Action Man lifestyle then this wont disappoint. Buy it today. Having not seen this watch I was unsure of the purchase online. The watch is great, all functions work well. Some reviews stated the watch face to be quite large and as I have a fairly small wrist was expecting to be too big - it is not too large at all. Got mainly for the tide times - cant complain about anything. Very pleased with watch,very well featured,very useful as backup if needed,only thing is the quality of the paint on the bezel, marks to easily but on the whole recommended well done casio! This is an awesome wrist watch and specially if you like chunky digital display watch then you should definitely check this watch out. Ill start with the exterior: the band and the case are all resin but very well built and should last good few years without any scratches etc. if you are a bit careful while using it. The watch is all digital and does NOT have analogue hands unlike some other models of Casio like G-shock. Overall the watch looks very manly and if you have a broad wrist then this should suit you very well. Now coming to the features: if you read the description here at watchshop or Casios website youll see this is full of cool features. Apart from time which is super accurate due to radio controlled time update, this watch also as the ABC altimeter, barometer and compass: might need some calibration, moon phase if you are into moon watching, tidal information if you are into sailing or fishing - not very useful to me personally, world time, alarm, stop watch etc. The time is always accurate and being in UK and also Europe should help as we are within Anthrons range. I get very good quality radio signal and my watch is always updated. I also believe it auto-updates DST and non DST. Hopefully that should give you a fair idea about the watch and there are quite a few videos on YouTube if youd like to see it in action. Overall, Im very happy with the watch and would highly recommend it. The watch comes in a nice wooden box and a multi language instruction book about 1 inch thick. With so many functions it is hard to read through the book. Luckily this watch does most things automatically. Just hold the adjust button until the display flashes and use alto / comp to select the city and adjust to save. The watch was already charged and ready to go. The strap has a raised end as a safety feature but it just gets in the way when putting on / taking off. It is a large watch and I dont have large wrists but feels comfortable thanks to the support tabs under the strap. An excellent robust and stylish watch. The functions are easy to master and use and more importantly they are useful functions for outdoor activities which is exactly what you would buy such a watch for. Excellent Product and service ! Would definately recommend to anyone thinking of buying this product and from Watch Shop too. In general very pleased with purchase - product as expected. Fits nicely on wrist and functions fun. Absolutely love this watch in my hand. I had Citizen Chronograph before but after buying this havent looked back since. Its great for everyday use and the protection around the watch protects from every bumps. The watch is very comfortable in my hand. I am very pleased and this watch is highly recommended. A birthday present for myself Id already got one Pro Trek. Ive only just taken it out of the box so havent got to to grips with all the functions yet and am unlikely ever to master them all. 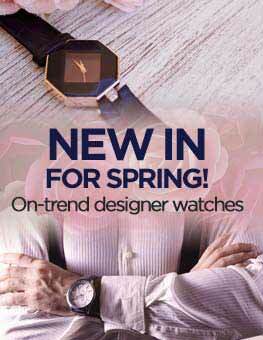 Watch is of very good quality and is comfortable to wear. It has radio controlled timekeeping so is always accurate. I live on the North Wales coast so I was keen to have a tide graph. The barometer function should also be useful for hill walks too. My other Pro Trek is my beater but can see this one taking over due to its light weight and comfort, despite its large face. I really like the looks of the thing and think it is fantastic value for money. My tip is, as soon as it comes back into stock, buy one! I spent some time choosing a watch for sailing. This appeared the best compromise between cost and features I have to say it has exceeded expectations in it operation. It gives me a reasonable indication of the state of tide at Hamble including height albeit the graph does not support the double high tides so some interpolation required. The barometer and compass seem to work well. The buttons are well protected from accidental operation and they are sturdy. Only negatives are that I miss analogue hands I struggle to read the digits due to poor close eyesight and the lack of sunrise/set time, which is a surprising omission. Oh.. and it is pretty huge. Great watch with so many features. I wanted a watch for hiking and cycling and this does all what I need. Comfortable watch every on smaller wrists. Packed full of extras which I will properly not use every day but nice to have. The solar and atomic time keeping is a nice touch. I really like my new Casio Protrek 2500. The watch arrived within 2 days after my transaction. I can recomend that to everybody. Perfect for skiing and holidays - great value considering the extensive functionality available. Good looking watch for a big wrist. Only complaint is the light doesnt stay on long enough when checking time in the dark. The best way to describe this watch is wow! I absolutely love it!!! I was looking for an ABC watch primarily for compass and thermometer and both of these functions work well here. The compass is slightly off, but it can be reconfigured and should only be used as a rough guide anyway but it works great for me. also if you hang your watch from your rucksack its an easy way to give the solar cells exposure and gain an accurate temperature reading. With so many features I thought it would take a year to work it all out, but it is so logically set up in 10 minutes every menu was altered to my preference very easy to use. The face is quite big but I think this actually works for the watch giving it more of a burly, outdoors and active man statement about who you are or want to be. With so much information being displayed on the main screen a large face is necessary and this does make time reading possible at a glance or when the face is covered with raindrops. The only negative I have with the watch is the strap. I have the resin strap, which has ridges on the inside so it hug the shape of your wrist, which is a feature I really like. However, under the watch face, on either side are two moveable ridges which are there so the watch face sits as flush as possible to your wrist. Once again I think this is a good design idea but they keep catching the hairs on my wrist and yanking them out! I no longer have to worry about a tan line because Ive got a permanent watch shape of missing hairs on my wrist lol From this I am not sure if the titanium would be a better bet or replace the straps which I am doing with NATO G10 straps. In conclusion I love the watch and would highly recommend it and if it ever gets smashed on one of my many adventures, I wouldnt hesitate to get another. I chose this watch over a similar one made by timex and I think I made the right choice, robust yet lightweight for its size. Fairly easy to navigate and covers everything I wanted it to do. Having read other reviews I agree that to get a temptrapure you have to take it of you wrist but dont worry not for long and you can put it back on. this is a great reliable abc watch, very comfortable to wear and very acceptable accuracy. If you are looking for one I have had a few and this is by far the best!!!! Already had a lower end tough solar but wanted something a bit fancy that could withstand military training. It performs well and although overwhelming at first is logical to operate. Only critisim is with the tide chart. While it tells you the tide state at certain times eg. 060, etc it doesnt give exact times for H/L. This watch is probably one of the most exciting watches I have purchased from watch shop,it recharges with sun !night and. Artificial light.It can do all kinds of things,it is multifuctional , and it looks great on your wrist,every watch lover should have one in their collection. Pretty much worked out of the box and what needed to be set up was done easily with clear instructions. Functionality is excellent for a watch of this price and reflects quite accurately other devices I have to measure temperature, pressure, etc. Very good, watch is perfect for anyone spending time outside. Has plenty of functions but altimeter tricky to get your head around. The product is exactly how I expected to be. I am very happy with it. Delivery was fast and on time. Great product, Great service, would recommend ! Compass easy to use and although quite a big watch looks fine on an average wrist. Instructions simple and a bargain. This watch is excellent. Time keeping superb ans the additional features are also effective although not used them all. Particularly like the barometer. Dial is clear, easy to read and watch doesnt feel as bulky as it looks. Perhaps best feature is never needing a new battery! Very pleased and a reasonably priced for features. Im absolutely happy about my watch and I would likeas an improvement to have a red line going through the strap. This watching is awesome good price to lots of features & good quality solar power 200m water resistant what more could you ask for a top brand as well. 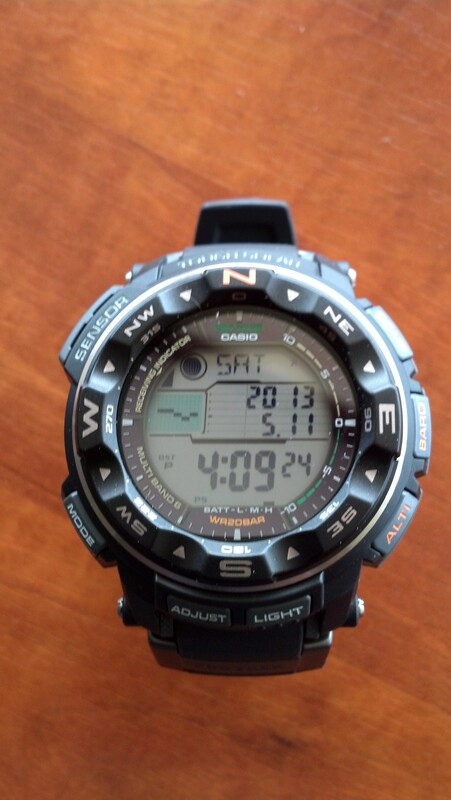 Casio Protrek prw-2500-1er does all it says on the box. All I need for sailing and walking. great watch, lots of functions the time is always correct and no worries about it not being waterproof after the batteries are changed, you never need to change them! Very good like sony watches especially the ones with soler power and also radio controld . Probably the best watch I have ever purchased. Simple and easy to use but with loads of functions. If your a traveller them this is a must have. Solar powered as well so no need to spend time finding someone who can change the battery and seal it properly. Great for the beach and normal use. I absolutely love it and got a good price for it here too. 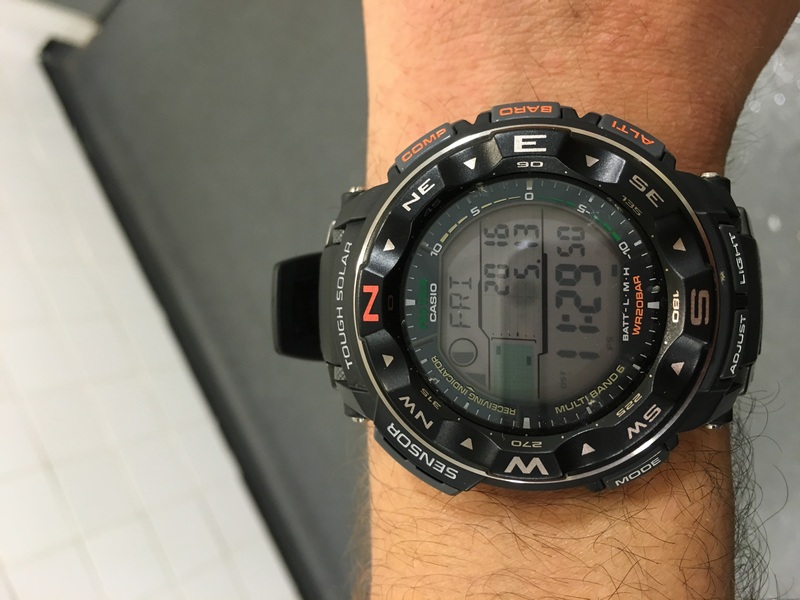 After looking for a long while for a watch that would carry out a multitude of tasks, I eventually decided on the Casio PRW2500-1ER. On taking the watch out of the box it was clear that it was a quality piece of kit, although I would like the directional bezel to be a bit stiffer to turn. This watch has so many features.....Tide graph, moon phase, digital compass, barometer, thermometer, altimeter, world time, stopwatch, countdown timer, waterproof to 200m. 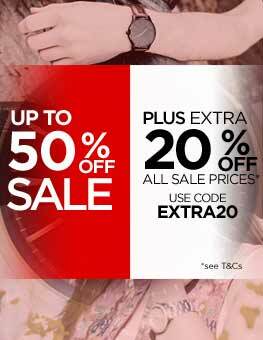 It really is amazing how much they can fit into one watch at a discounted price of under £200. You would think that with so many features it would be very complicated to use, but when you understand the basics it is actually really easy and logical. In terms of the features, the tide graph, moon phase, barometer and compass are all very accurate and have not needed calibrating in the slightest. The thermometer is also very accurate, but bear in mind that to get an accurate reading, it needs to have been off your wrist for at least 20 minutes before taking a reading. The only slight achilles heel with this watch is the altimeter, which rather than using GPS to establish a reading, uses the barometer. This is fine after you have calibrated it, however, you do need to calibrate it regularly in order to get accurate readings as changes in the weather can alter the reading by +-150m in my experience. All in all a fantastic watch and a must have accessory for anyone who enjoys outdoor pursuits. I initially bought a Citizen eco-drive red arrows watch however, given my job and as good as that watch was, I was scared of scratching it on every occasion. Therefore, back to the Watchshop and purchase a watch I know will stand up to any test. I usually go for G-Shock as the preferred option however, upon reading reviews and now wearing one myself, its Protrek all the way for me now, I dare anyone to say this watch is anything less than 5. Cant fault the accuracy or style, combined with price, its a must. I bought this watch after looking at several sites including amazon. I decided to buy from the watch shop as the price included express delivery at no additional cost. I wasnt disappointed ! The watch arrived next day and in excellent condition. Im very pleased with the watch itself, if fits perfectly on my wrist even though my wrists arent that big ! It looks great and I look forward to many years of use. A fantastic watch and a good price from Watch Shop. Slightly bigger than I imagined but not in any way obtrusive to wear, and smart / stylish enough for formal clothing. Huge range of features and a very clear display, and the processor seems quick enough to cope with rapid demands. Need to adjust the tide times for locality and the barometer can be an hPa optimistic at times but it gives instant access to the information we need. A quality piece of kit, makes you wonder what Casio will incorporate next! I swim nearly every day in the sea and I had been looking at the Tissot range. However, I would need two of their watches to have the same functionality as the Casio. This watch has everything for the swimmer and sailor and is clear to read all relevant information and is accurate and reliable. This watch was bought due to me already owning a protek watch which has served me well over the last 15yrs. There are many features on this watch which are not only useful to the active outdoor types but it can be used as a every day around town watch. The display is clear and bright and the navigation buttons are easy to use. The instructions are easy to follow for each feature . The watch when on the wrist feels comfortable and very light and not to tight. All in all a fantastic watch for whatever the owner needs to use it for. My friend love this very much,and the price is nice! I will come back to buy others. watch was delivered on time.and watch itself is great does exactly what it says on box.very happy with watch and service. I bought this watch on Easter Monday, I received the watch on the Wednesday. What a great service from The Watch Shop. The watch is easy to set up, the instructions being very easy to comprehend and follow. The watch is spot on, the functions are faultless, it looks good and feels good, not too heavy. I would gladly recommend this watch and the Watch Shop. Excellent service. my order was delivered with next day delivery service ,wery pleased with this.i was looking for watch with tidal and compass features ,because i like outdoors and fishing ,but this watch features even moor you can looking foor.tooday been up at mountains and altimeter was realy good. i am realoo pleased.thank you. Bought as a present, but the digital watches are great. No mechanical watches can do all the things a digital watch can, and at a fraction of the price and with amazing accuracy. This watch has a lot of features. Watch exactly as described. Easy to set-up and to operate the wide range of functions. Would have liked a means to change date format from mm dd to dd mm, but that is being rather picky. First impressions are superb! The watch is big with a super big face which is very easy to see. The watch looks very robust and has many impressive features. The watch pins which attach the case to the bracelet are screws so far more resilient than the usual vulnerable pins. The manual is very easy to read and surprisingly simple when considering the complexity of the many functions of the watch. As I live next to the sea I was pleased to see how accurate the tide graphs were. As was the compass and barometer when compared to other very reliable sources. For a big watch the weight is minimal and the design means its very comfortable on my thin wrist. The watch strap is tough looking and very strongly built. The only function I had to adjust was the temperature measurement which measured too high but adjusting this was simplicity itself. This is the best and most comfortable watch I have owned and cannot recommend it too highly. Especially from the Watch Shop whose prices are far below even Amazon with free delivery. This stylish watch offers the widest possible range of features at a suprisingly low price. It is the perfect one stop device for anyone venturing out into the great outdoors whether professionally, or simply for pleasure. The compass is extremely accurate and easy to interprete, and supplemented by the barometer and altimeter offers the user everything necessary for an enjoyable day in the field. Being robustly designed and constructed and waterproof, the watch can handle to rigours associated with most outdoor activities without fear of a loss of function or accuracy. 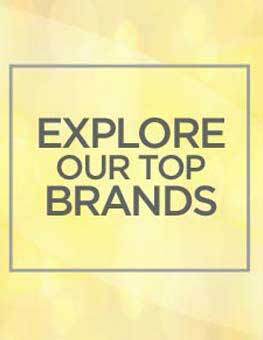 All in all a five star product and one I would thoroughly recommend. I like this watch, really perfect for outdoor activities. Sensor very presice and U can calibrate it. Would be fun test this watch in mountains =). Absolutely brilliant service ... The experience has changed my partners views on Internet shopping he loves it!! Thank you for a quick, professional service. Exactly what I was after - exactly matched the description - perfect for what I'm after - bristling with toys - swimming and scuba-safe - couldn't ask for more. Astonishing large watch that has EVERYTHING: Solar powered, altimeter,barometer,compass - all very easy to use and understand - radio controlled,world time etc.An impressive and distinctive piece,especially outdoors. If you live an outdoor life or engage in outdoor activities near the sea as I do, this watch is excellant, giving compass directions, barometric pressure, altitude and state of the tides, as well as full automatic calendar. I like the colour black with black resin band which fits the wrist better than metal and does not slip around. In any case I found I am allergic to titanium which gives me a rash after a few days wear. Unfortunately I live in an area of poor reception so I do not get the radio time signal, but the accuracy of the quartz movement is such that I can wait till I am visiting an area with better reception to up date the watch if necessary. It will only need a second at worst case anyway. Another good thing is the sapphire glass which is hard to scratch.